​Change Your Life In less than 9 Months & Start A Great Career with our Advanced Registered Massage Therapy Certificate Program! Being a Registered Massage Therapist means you are a part of a highly skilled team of Healthcare professionals who help people gain back the quality of life they once enjoyed through Manual Therapy. You may be working in a chiropractors office, health spa or you may even be on your own, running your own practice. You get to decide where your career takes you. If this sound like a rewarding career to you, start your career as a Board Certified Massage Therapist with us. 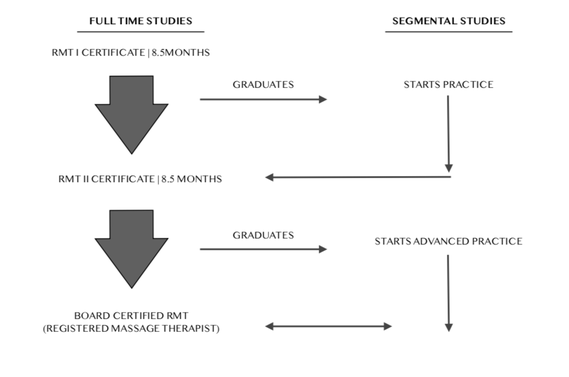 The RMT Certificate programme is catered for those who needs to balance their work life and still graduate to be a Board Certified Massage Therapist. The course will be a slight squeeze as students are expected to complete all requirements to graduate from completing the Research / Thesis, Clinical Practicum, Clinical Theory class, Anatomy / Physiology, Pathophysiology, Orthopedic Testing etc. The completion of this programme is just the first part of the complete certification to be a Board Registered Massage Therapist. Graduates of this programme are able to practice as a Massage Therapist but not Board Certified RMTs. ITI has taken yet another a leap with its Advanced Certificate in Massage Therapy program being the first in Asia to introduce a 1200 hours which meet and exceeds the minimum requirements for Canada and U.S to be a Registered or a Licensed Massage Therapist. This will help both introduce what being a RMT(Registered Massage Therapist) and working as one would take on an International standard. The Advanced Certificate in Massage Therapy program is made available as we saw a need to help distinguish the difference between a masseuse and a massage therapist to the public in this region, together with bringing the quality of science/ evidence-based study and treatment for patients who need a more sound approach for treating and managing pain and dysfunction. The program looks forward to producing critical thinking clinicians allowing them to make decisions based on the most comprehensive assessments for patients looking for any form of therapeutic therapy through soft tissue management. Conduct a massage therapy practice within a legal, professional and ethical framework. Apply business principles relevant to a massage therapy practice. Collaborate effectively and professionally with clients, colleagues and members of an inter-professional team. Develop and maintain therapeutic relationships to optimize client's health and wellness. Collect and assess clients information to determine their state of health and the treatment goals. Develop and implement a plan of care according to the client`s condition and the treatment goals. ​Evaluate the effectiveness of the plan of care. Maintain documentation securely, accurately and in a timely manner. Develop and implement ongoing effective strategies for personal and professional development to ensure quality care. Identify and apply discipline-specific practices that contribute to the local and global community. Ba able to interpret correct clinical impression. Conduct a systematic client assessment. Formulate a complete clinical impression. Upon completing the 8.5 months programme and meeting the requirements for it, graduates can start practicing as a Qualified Massage Therapist owning their practice or for an organization. Studying with our RMT program opens up plenty of doors and opportunities, you can expect yourself to be working Internationally and not worry about having to take the province or state exams which we already meet and exceed. With our rigorous education program, you can be assured that you will be both highly competent and prepared for your new career as an RMT.